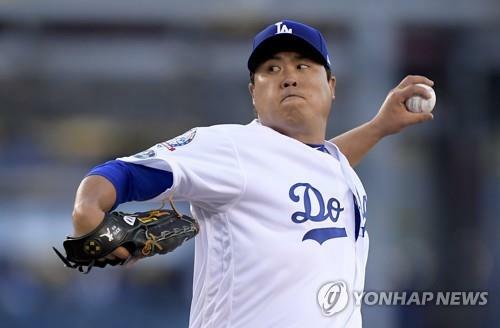 SEOUL, Oct. 12 (Yonhap) -- Los Angeles Dodgers' South Korean left-hander Ryu Hyun-jin will start Game 2 of the National League Championship Series (NLCS) against the Milwaukee Brewers. Roberts explained that he wanted to ride Ryu's hot hands while he could, and also use Buehler, who took the loss in Game 3 against the Braves last Sunday, on extra rest at home. "We want to keep Ryu as current as possible. He's pitching really well," Roberts told MLB.com. "And then just to give Walker just a couple of extra days on the front end to get him ready." He'll be facing a vastly different lineup this time around. Led by the NL MVP candidate Christian Yelich's 36 home runs, the Brewers ranked second in the league behind the Dodgers with 218 dingers and topped the senior circuit with 124 steals. The Dodgers have made the postseason every year since Ryu's rookie season in 2013. But this is Ryu's first postseason appearance since 2014, after making just one regular season start between 2015 and 2016 after shoulder and elbow surgeries, and getting left off the Dodgers' postseason rosters in 2017.